Home / Belmont Stakes 2018 / Justify Clinches Triple Crown – Belmont Day Results! Would he or wouldn’t he? Justify defied all to masterfully win the Triple Crown and did so going wire-to-wire on an open and clear lead. Restoring Hope was used to keep Noble Indy in check and Bravazo regressed as projected chasing Justify in the early going. Both Hofburg and Vino Rosso ran very good races finishing on even terms for third and fourth, respectively, and well clear of the rest. As only the 13th Triple Crown winner in history, Justify stands apart from the rest as the only horse that won the Crown without a race at 2 years-old. He remains undefeated and can now get that deserved rest as he continues his campaign later this summer on his way to the Breeders’ Cup Classic. Could we see a showdown between Justify and stablemate West Coast? What may get overlooked in Justify’s capturing of the Triple Crown is the incredible race Gronkowski ran, surprising even his trainer, Chad Brown. What handicapping service anticipated Gronkowski would finish a strong 2nd in this race? Considering he had to overcome not running since March, never having run beyond a mile, running on dirt for the first time, coming up sick before the Kentucky Derby and then on top of that, breaking slow and ending up 15 lengths off Justify in the early going was just mind numbing. In the end, the Super Screener Super Stars of Justify, Hofburg and Vino Rosso finished 1-3-4 and we can now look forward to the Haskell and Travers Stakes in the weeks to come as this second chapter of the top 3 year-olds begins. The Super Screener Top Board Hitter pick, Hi Happy, finished 3rd and the Super Screener Top Value pick, Sadler’s Joy finished a very game 2nd coming from last of all in the field of 13. The top 4 finishers in the race came from that top 6 ranked horses by the Super Screener which lead to the suggested Superfecta score of over $2,000. The Super Screener Top Win and Top Value pick, Bee Jersey, continued that impressive form cycle ascent while taking this field through brisk fractions and holding on gallantly for the win. Mind Your Biscuits finished a solid 2nd in this race just as he did last year demonstrating that he will continue to be a force to reckon with on his way back to another appearance in the Breeders’ Cup Sprint. Interesting to see that Bolt d’ Oro finished last and one had to question why connections would have thrown this tired 3 year-old against older and much superior competition when the plan was to rest him and come back to a stakes race restricted to 3 year-olds later in the summer. Can’t believe how badly they have mishandled this colt. The Super Screener suggested Trifecta and Exacta wagers fired for nearly $1,000 despite the favorites finishing 1-2. It was déjà vu all over again as last year’s winner of the G2 Jaipur, Disco Partner, stormed home again taking advantage of another hot and pressured pace set up by his stablemate, Pure Sensation, who, as we anticipated played the role of “rabbit” for Disco Partner just as he did last year. Considering he just came off an injury he ran one heck of a race to hold 3rd. He will pop a big race next out and is one to follow as he cuts back to his wheelhouse 5f distance as he now heads to Parx for the G3 Parx Dash which he won last year coming out of the Jaipur. Conquest Tsunami uncharacteristically pressed the pace instead of driving it and was good enough to hold on for second at 6-1 as a Super Screener top choice and the better of the two Peter Miller horses. “#5 Disco Partner is the clear Super Screener Top Board Hitter pick and a Trifecta finish is about as certain as it gets. He has won 7 races in 11 starts on the Belmont turf and he gets back to the firm turf condition he needs for engaging that late kick. He won’t be too far back, maybe just about 4 lengths off the speed battle up front and then come with that big rush. The Super Screener suggested Exacta wagers clicked for $520. It was the “other” Chad Brown horse, A Raving Beauty, that proved best on the day. Screener Top Win picks, Lull and Off limits, finshed 3rd and 4th respectively. Proctor’s Ledge once again outran her Super Screener score. It was a Super Screener Top Long Shot pick, Still Having Fun, that took advantage of the projected hot and swift pace which indeed materialized and he won going away at odds of 13-1. Engage, out of the Chad Brown barn, ran another good race sitting off the pace and was good enough to finish a clear second. Strike Power disappointed as a top win player getting consumed by the hot pace and Madison’s Luna broke tardy from the inside and was never a factor. On a day that featured some nice scores on the undercard, and then we get treated to a dazzling and historic Triple Crown winner, it just doesn’t get any better than that. But wait, there’s more! Next Saturday the spotlight turns to Churchill Downs with a card that features five Graded Stakes anchored by the G1 Stephen Foster, which will feature horses that were big players on the Triple Crown trail last year including Irish War Cry, Lookin At Lee and Girvin. Should be another super day of summer racing. 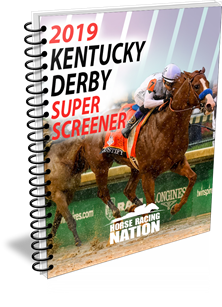 ← Previous Story 2018 Belmont Stakes Super Screener Now Available! Next Story → Ice Cold Ohio Derby Exacta – Get The Recap!